Brass 1/2" hose barb to female garden hose swivel coupling (for connecting 1/2" ID Vinyl hose to the pump). Using our links helps support our site at no additional cost to you - we thank you! I've been asked a few times how I clean my lines so I've put together some quick information here. 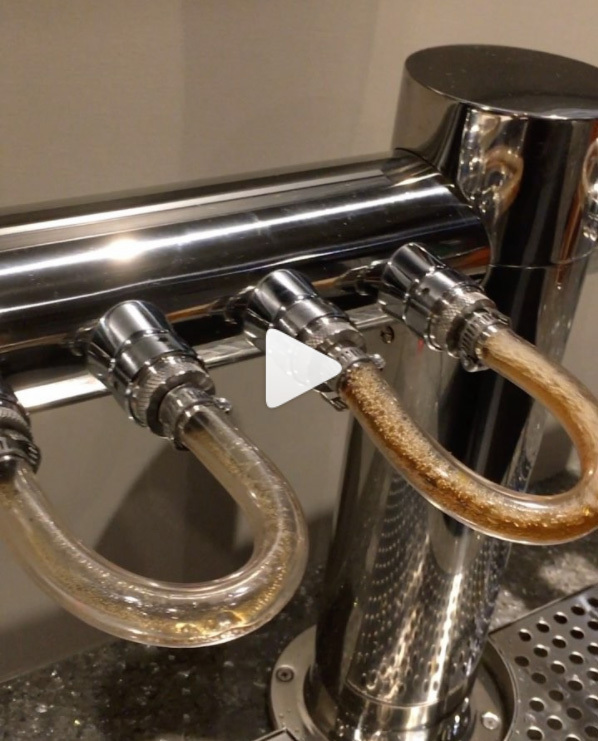 Beer lines should be cleaned regularly to get rid of hop resins, yeast residue, sugar build-up, bacteria, proteins, mold, beer stone (calcium oxalate) and other deposits that can accumulate over time. Many will create off-tastes in your beer. Deposits can also create tiny nucleation sites that promote gushing and poor head retention. 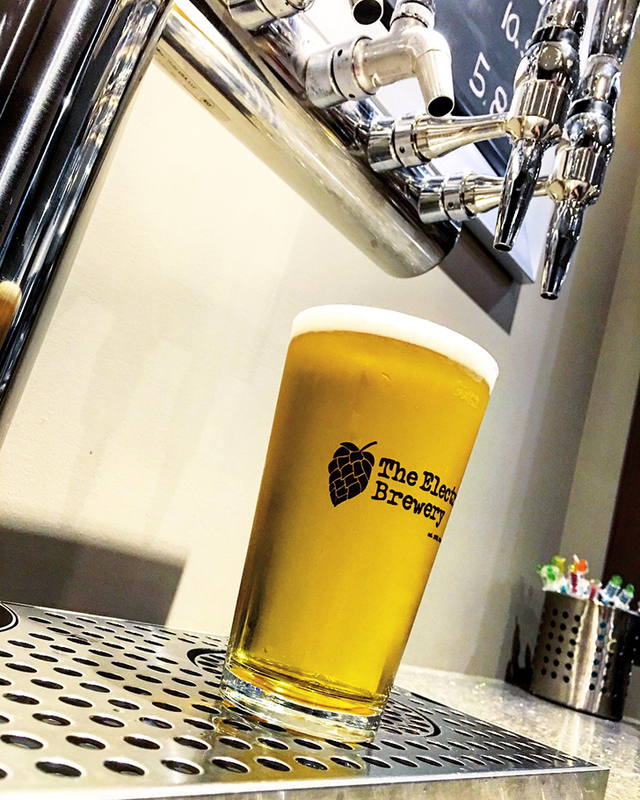 Every 2 weeks: Use Beer Line Cleaner (BLC) or Liquid Line Cleaner (LLC) to remove hop resins, yeast residue, sugar build-up, bacteria, proteins, and mold. This is an alkaline (high pH) cleaning. Every 3 months: Use Acid Line Cleaner (ALC) to remove inorganic materials such as calcium oxalate (beer stone) and calcium carbonate (water stone). This is a acid (low pH) cleaning. At home people can go ~6 weeks between using BLC/LLC but many will go longer without any issues. At home many never use ALC either. Use BLC/LLC regularly and you may never need to use ALC to remove beer stone or water stone. For my home use I aim to do a BLC cleaning 3-4 times a year and the ALC cleaning once a year, but this often seems to slide a bit. 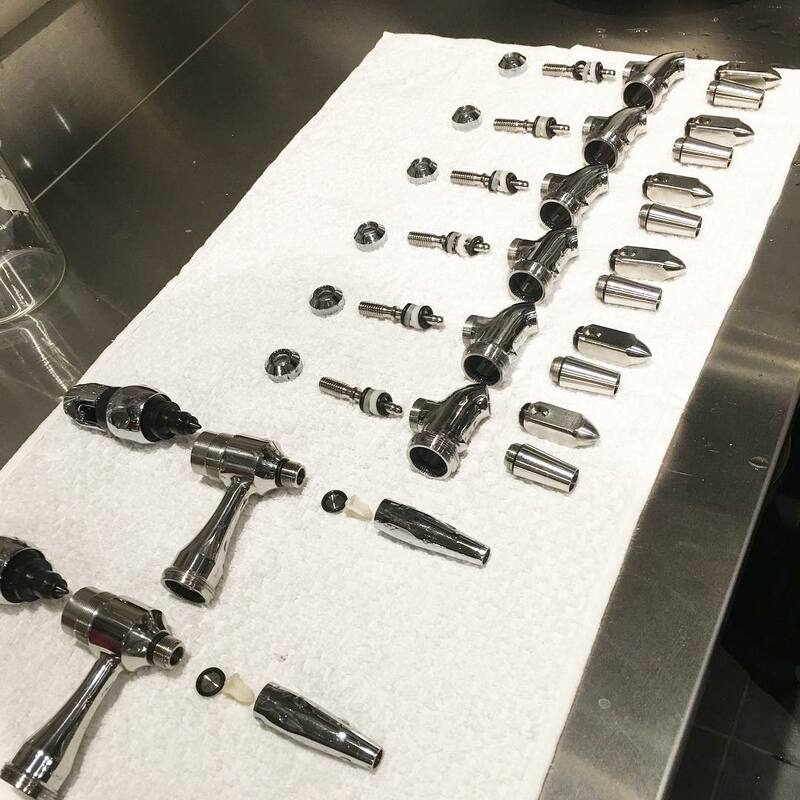 I have 8 taps in the basement bar so cleaning the lines individually would take an inordinate amount of time, so I link them all together in a giant loop and recirculate cleaner exactly how the pros do it when cleaning the lines in commercial restaurants and bars. 1. Connect the beer lines on the quick disconnect keg side together with the QD adapters between lines 2-3, 4-5, 6-7, and 1-8. 2. Remove the faucets on the serving side using a faucet wrench. 3. Install short vinyl hose jumpers on the serving side between taps 1-2, 3-4, and 5-6. Connect a return line hose to tap 7. Connect the pump to tap 8 using the brass 1/2" hose barb to female garden hose swivel coupling. Everything is now connected in one giant loop. 4. Fill the bucket with water and drop in the pump. Leave the tap 7 return line in the sink to allow it to drain. Turn on the pump by plugging it in and the beer already in the lines is flushed down the drain by the pump using the water in the bucket. Removing all the beer from the lines first means the beer line cleaner has less work to do. 5. Once the lines only have water in them, turn off the pump and fill the bucket with hot water and liquid line cleaner. Follow the instructions for the amount of cleaner to use. It usually takes only an ounce or so of cleaner per gallon or two of water as it's really caustic stuff. The tap 7 return line is placed in the bucket, the pump turned back on, and the water with cleaner is recirculated for ~30 minutes. 6. While the cleaner is recirculating, disassemble, soak, and clean the faucets that were previously removed in Oxiclean. Re-assemble. 7. After ~30 minutes of recirculating remove the tap 7 return line from the bucket and place it back in the sink to allow the cleaner to go down the drain. As the bucket empties fill it once or twice more with water to flush all of the cleaner out of the the lines. 8. Remove all of the jumpers on both the keg and serving sides, and re-install the faucets back on the tower. Once installed, make sure to push them all the way back to turn them off. 9. Reconnect the quick disconnects to the kegs. Hint: Don't reverse the order of the last two steps unless you like beer all over the floor). 10. Drain the water in the lines by pulling from each line until beer starts to flow again. Check out the videos above for more information. - If you have less lines then you'll obviously need less jumpers/QD adapters. When cleaning the 2-tap kegerator lines I only need to use one QD adapter to join the two together, and no jumpers on the serving side. - Don't try to remove faucets with anything other than a faucet wrench. You'll only end up scratching/mangling things if you try to use (say) a pair of vice grips. A faucet wrench is specially made for removing/attaching faucets. - Don't have a tap tower yet? Stay away from the really cheap bar/draft towers. Some of the junkier stuff is softer metal and won't hold up over the years to constant faucet removing/attaching. I recommend and use a commercial grade tower from Micromatic. It's the same stuff you'll find in many bars around the world and will last you a lifetime. - Beer line cleaner is very caustic. Avoid getting any on your hands or other surfaces. Heed the warnings on the bottle. I've done something similar but keep the faucets on the towers and run my loop with some 1/2" silicone hose. It slips over the end of the faucets and doesn't seem to leak. Hangovers hurt....but good memories last forever! How clean are the insides of the faucets after doing that? I find that over time some gunk does accumulate so I like to take them apart for a thorough cleaning. Thanks for posting your techniques Kal. 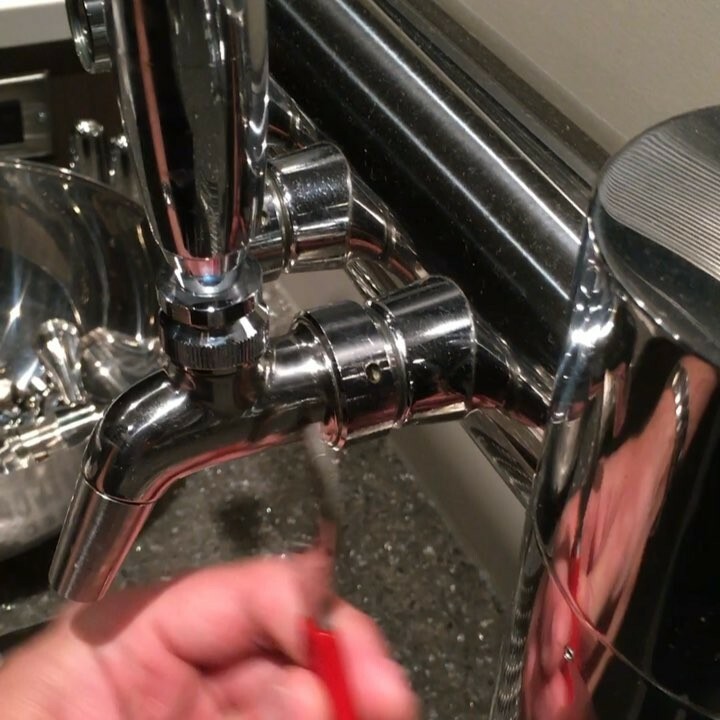 Honestly I've never taken apart my taps. I'm feeling mildly convicted that I should. When I empty a keg I use the keg cleaning process as an opportunity to clean that individual line/tap. 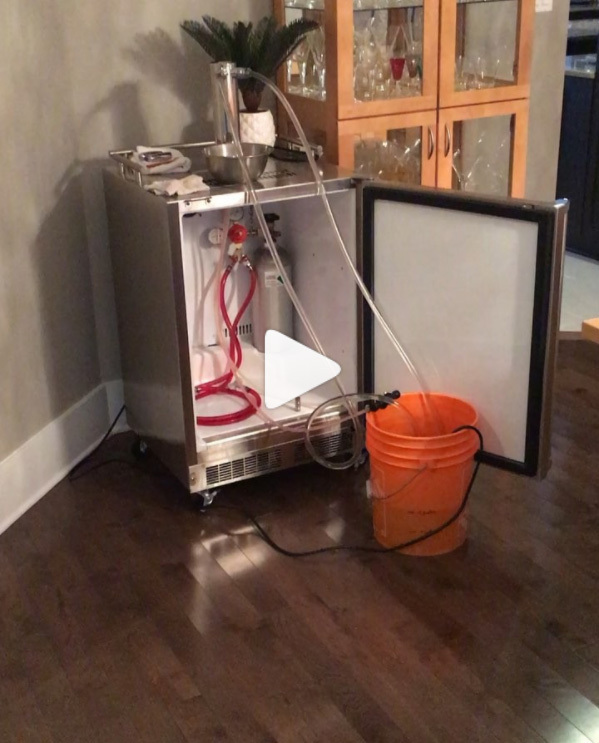 I first rinse my keg with hot tap water and then put a little pressure on it and push a gallon or two thru the line/tap. Then do a PBW soak and afterwards push a couple gallons of that thru the line/tap. Then a quick rinse and fill the keg with Star San and I'll push some Star San thru the line then. Each step of the way I try to modulate the tap handle opening to get some turbulent flow in the tap to hopefully clean it out well within. Bottom line, I try to get some extra use out of each cleaning step during keg cleaning and each line is cleaned after every keg. Anyone else do something similar? Time to put away the sunroom kegerator, but first the taps and lines are cleaned. Thanks for the write-up, Kal. It's thorough and well documented, as always. I have been flushing 4-5 gallons of Oxyclean solution through lines after each keg and soaking faucet parts in the same solution for years, with seemingly good results. I always have seltzer on tap, and rotate that through each of four lines, to see if any flavor resides. That said...I've been making more brett and sour beers, so I'm thinking that a more rigorous process is in order. I'm planning to transition to cleaning at 160+, to handle bacteria and brett. I'm also going to expand to seven or eight faucets. To ask the obvious, you find that a purpose made beer line cleaner makes sense, that oxyclean isn't adequate? Yup. Oxi doesn't break down beerstone or some of the tougher stuff without scrubbing/contact. You need to use something pretty caustic to do that via non-contact and that's where the line cleaner I use/recommend above comes in. That's a clean setup you have there! Thanks for the cleaning tips, I really need to be a bit more diligent when it comes to cleaning! Drinking: Blackberry Wheat, Blood Orange Wheat, Brown Ale, Hazelnut Brown Ale, Peach Mead, Pear Hard Cider. Kal thanks for the timely write-up as I'm currently building my keezer. Great Kraig! Glad you like it!